The US, Crusader of Democracy? We often hear how the US is so interested in seeing democracy flourish across the planet. It’s regularly claimed to be one of the principal reasons for its endless interventions in foreign countries. 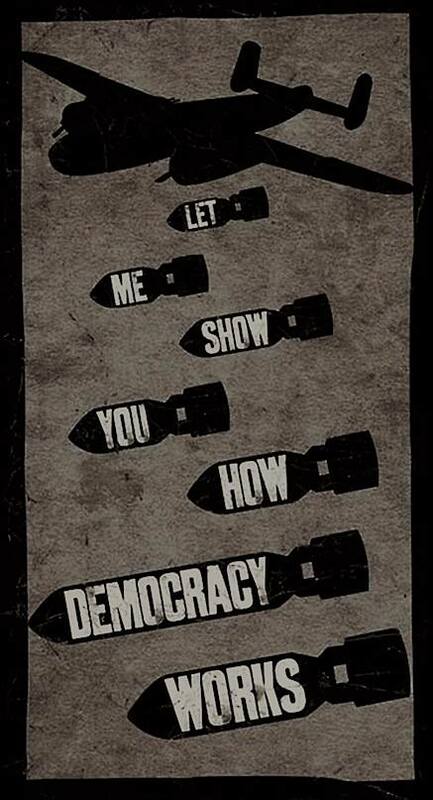 Not only did the US want to bring freedom to countries like Iraq and Libya, they also wanted to bring democracy. Considering this, one would assume that the last thing the US would do is overthrow democratically elected governments, or would they? Let’s take a walk down memory lane. Fiji, 1987: “The democratically elected multiracial government led by an indigenous Fijian doctor, Timoci Bavadra”(24) that had been “studying various options to cut off port access to nuclear-armed or nuclear-powered ships”(25) in support of a nuclear free South Pacific, was overthrown in a US backed coup. US Ambassador to Fiji (1981-1982), William Bodde: “The most potentially disruptive development for US relations with the South Pacific is the growing anti-nuclear movement in that region. A nuclear free zone would be unacceptable to the US, given our strategic needs. The US must do everything possible to counter this movement.”(26) Former Deputy Director of the CIA (1972-1976) and US Ambassador to the UN (1985-1989), Vernon Walters had met with Colonel Sitiveni Rabuka “shortly before the coup.”(27) A military government under Colonel Rabuka would rule Fiji for the next 5 years. The fingerprints of US imperialism can be found all over the manufactured insurrection in Syria, in keeping with the goal of de-stabilization and eventual “regime change”. Former NATO Commander Wesley Clarke has gone on the record stating that as early as 2001 that Syria was on a list of targeted nations. In 2002 Undersecretary of State John Bolton gave a speech entitled “Beyond the Axis of Evil” that listed Syria as a handful of nations that “can expect to be targeted” Fast forward to Daara in 2011. What has been portrayed in mainstream western media outlets as a “protest movement” upon closer examination has been revealed as a Washington inspired insurgency carried out by takfiri foreign militants armed, trained, and funded by US NATO proxies. CIA Muslim Brotherhood assets were already in place to snipe at both police and protesters. Since then the CIA has funneled hundreds of billions of dollars, as well as staggering amounts of arms to jihadist recruits all of which have poured unabated into Syria. So we have multiple occasions, an incomplete list at that, covering more than half a century of the US ousting democratically elected governments, against the will of the countries’ people. Why would they do this if they care so much about democracy, you may ask? Well, as seen from these events above, the truth is that they don’t care, at all, about democracy. It is useful to keep this in mind when considering current events in Syria and any future plans the US may have for other countries. They may say democracy is one of the driving forces but the reality is, it isn’t. (24) William M Leogrande, Making the economy scream: Us economic sanctions against Sandinista Nicaragua,Third World Quarterly (1996) 17 (2) 329-248. 1 Comment on The US, Crusader of Democracy? I think U.S. actions are based on the theory that the world’s supply of democracy is limited , and if some countries hoard too much of it , other countries won’t get any at all. ” Spreading democracy ” is thus more like redistribution of democracy , analogous to redistribution of wealth. The U.S. itself has offloaded virtually all of the democracy it once had , just to loosen up the supply for others. Clearly there’s no evidence at all that this theory holds even one drop of water , but for the U.S. , that’s not really a problem.